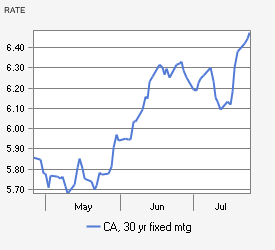 It shows that the interest rate for a "typical" home in OC has gone up from about 5.7% to about 6.5% since May. When I run the numbers, this translates into a roughly 9% higher mortgage payment! My guess is that this change alone will cause 10 to 20% of those that could have qualified for a loan in May to now be unable to qualify. Put another way, the recent run-up in interest rates has reduced the effective demand for homes in OC by 10 to 20%. Now, if we assume that housing prices are unit-elastic, this change in interest rates/demand ought to cause home prices to drop between 10 and 20% more. Then there's the compounding effects of the price/demand declines. If prices drop, more people will walk from their homes. If more people walk from their homes, then there will be more inventory on the market and if there's more inventory on the market, prices must drop to meet demand. It's called a death-spiral friends and neighbors and the banks are bringing on themselves with the help of the White House...but guess what? You, me and all the rest of the American tax payers are going end up paying this particular bill in the form of bailouts and every other manner of Republican Socialism the Bushies can muster. How much more of this crap are we going to take? The interest is major big problem of the world,it create number of problems. Those persons who are involved in interest at the end it may of real estate or any other they will bear loss. The owner of houses who bought their houses through interest most of them are not satisfied. I think interest is not good in Islam because interest is unlawful. I think interest will be not allowed in muslim countries. I think interest is a big problem in the real estate field.